^ E. Wickersheimer, "Les Tacuini Sanitatis et leur traduction allemande par Michel Herr", Bibliothèque d'Humanisme et Renaissance 12 1950:85-97. ^ Brucia Witthoft, 'The Tacuinum Sanitatis: A Lombard Panorama" Gesta 17.1 (1978:49-60) p 50. 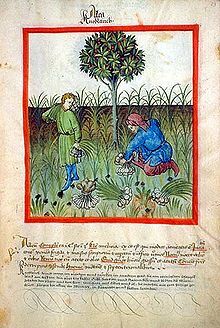 ^ "Magister Faragius" (Ferraguth) in Naples took responsibility for one translation into Latin, in a manuscript in the Bibliothèque Nationale, Paris, MS Lat. 15362 (noted by Witthoft 1978:58 note 9). ^ Witthoft 1978 discusses the Tacuina in the national libraries of Paris and Vienna, and the Biblioteca Casanatense, Rome. Carmelia Opsomer published a commented facsimile of the ms 1041 held in the library of the university of Liège. L’Art de vivre en santé. Images et recettes du Moyen Âge. 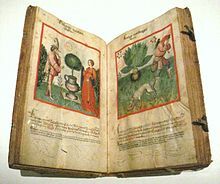 Le « Tacuinum sanitatis » (ms 1041) de la Bibliothèque universitaire de Liège, éd. de C. Opsomer, Liège, 1991.